The MAINE MASTERS PROJECT is an award-winning video series sponsored by the Union of Maine Visual Artists (www.UMVAonline.org), a not-for-profit educational organization established in 1975. The Maine Masters Project was begun in 1999 and has created an ongoing series of profiles of some of Maine’s most important and often less recognized visual artists who articulate the importance of art making. The series celebrates art making – it enhances our culture by encouraging people to think and feel more deeply. Through our curriculum guide series that’s now been launched with the first curriculum guide on painter Stephen Pace, we are beginning an effort to reach a younger audience of high school and college students. 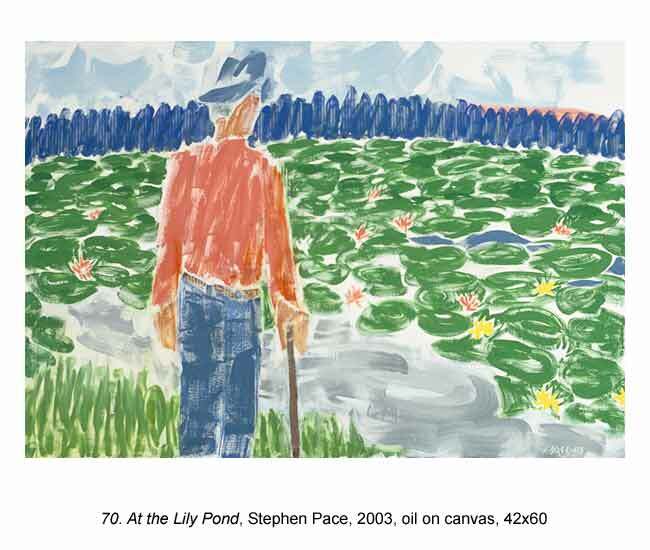 Born in 1918, Stephen Pace’s life has spanned most of the 20th and into the 21st century. His childhood years were spent with his family on farms in Missouri and Indiana and gave him a sense of the importance of family and hard work. Although he loved drawing throughout his childhood, his first formal art lessons were at the age of seventeen with Robert Lahr, a WPA artist from Evansville, Indiana. During this time, Pace began working with an architect doing architectural renderings and drafting. In 1939 a peacetime draft was instituted and Pace entered the Army as World War II loomed on the horizon. Along with designing posters for the Army, his architectural background was used to design buildings in the U.S. and England during the War. After the War but before returning to the U.S., Stephen continued painting in Paris encouraged by a commanding officer who admired his work and gave him the time to paint. It was there that he met Gertrude Stein and Pablo Picasso. Four years in the Army entitled him to four years of education under the GI Bill, which he used in part to study art in San Miguel de Allende, Mexico, where he met Milton Avery, one of his strongest influences and closest friends. From there he moved to New York City where his landscapes and figurative work gave way to the abstract expressionist movement of the 1950’s. 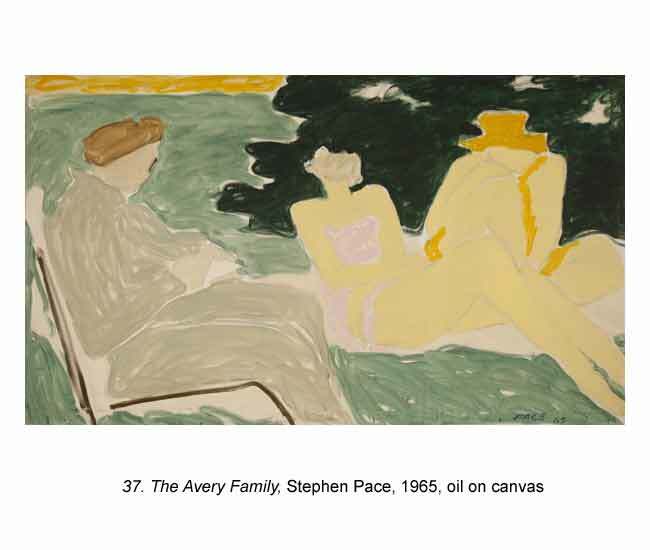 Through his friendship with Milton Avery, Stephen met artists such as Franz Kline, Mark Rothko, Barnett Newman, Jackson Pollack and Willem deKooning and many others who studied with him at the Hans Hofmann School. 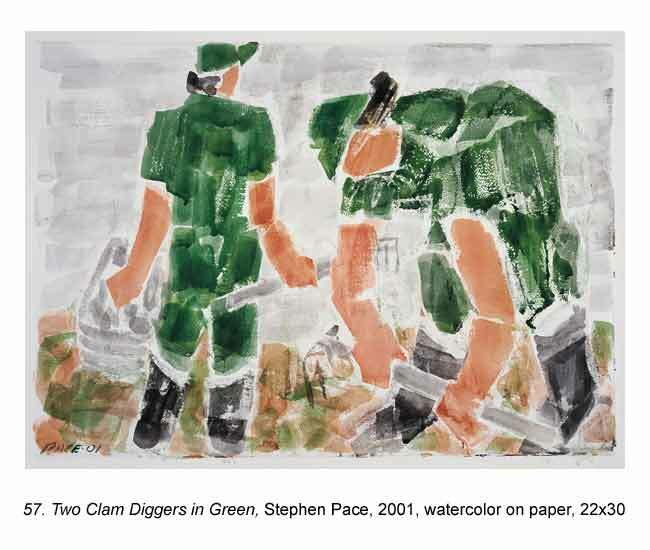 Pace met and married his lifelong partner, Palmina, a NY art buyer, who devoted herself to Stephen and his work. 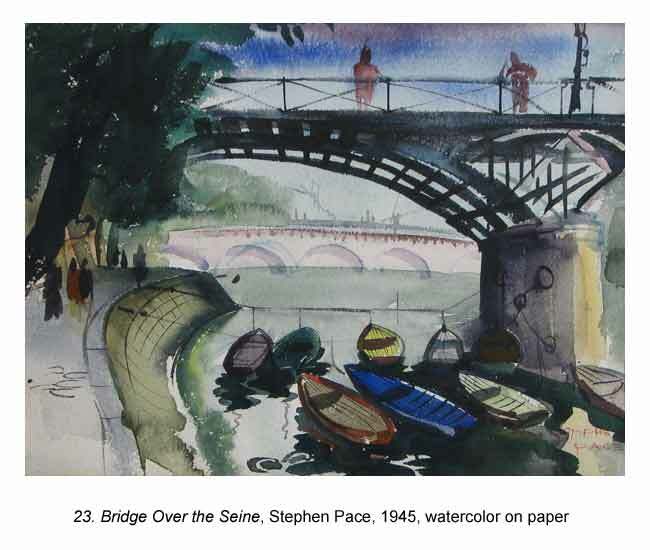 In 1950 and 51 they traveled to Paris and Italy where Stephen continued his studies. He used the last eleven months of his GI Bill time to study at Hofmann’s schools in New York and Provincetown, MA. His large abstract expressionist paintings where exhibited in major galleries in New York City including seven Whitney Annual and Biennials. 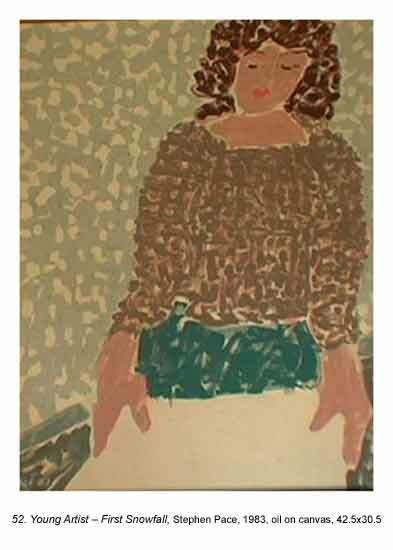 Then in 1960 they began spending the first of twelve summers in rural Pennsylvania which made Stephen realize his need to get back to figurative painting. But their allegiance was gradually transferred to Maine where he and Pam would camp on longer vacations. 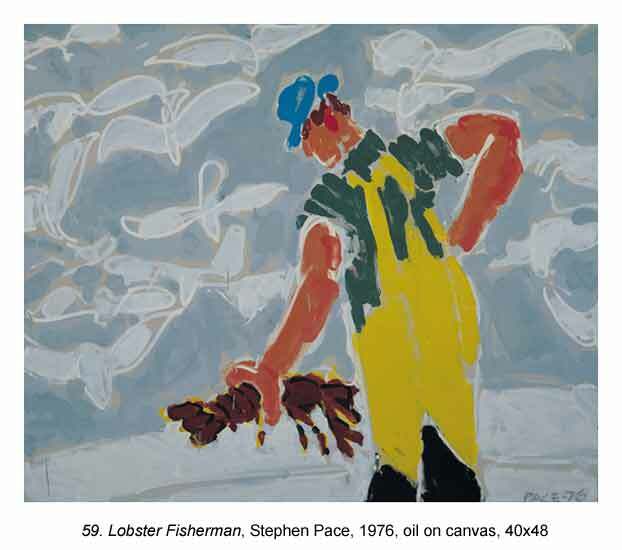 In 1972 the Pace’s bought a house in Stonington, Maine, a small fishing village on Deer Isle. Summers in Maine provided abundant subject matter of beautiful land and seascapes and the working people of the village. After spending more than fifty years between Maine and New York, Stephen and Pam returned to his boyhood home of Southern Indiana where he lives and works in a studio on the campus of the University of Southern Indiana. He and Pam donated their Maine home to the Maine College of Art along with the paintings in that house. Many other paintings have been donated to the Evansville Museum and the University of Southern Indiana in Evansville, IN. There, at the age of 90, he continues his lifelong commitment to painting. 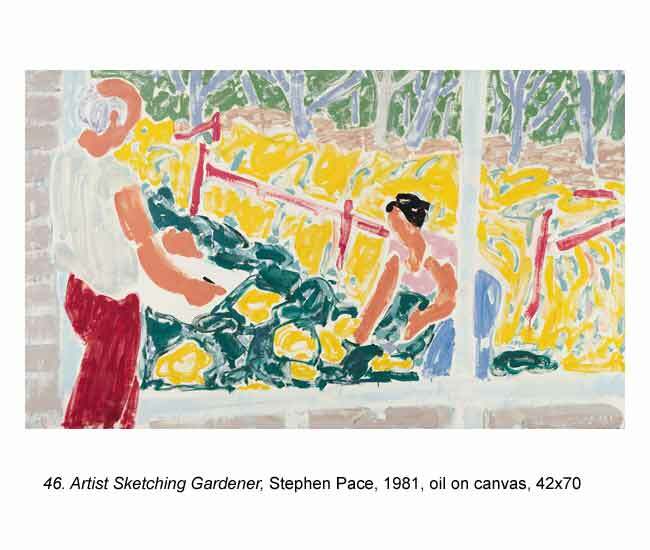 The study of the life and works of Stephen Pace introduces students to a life-long commitment to painting and the celebration of the artist’s personal world. Themes in Pace’s work include landscape, the figure, and symbolic imagery. Genres to be studied include regional and personal environment and lifestyles of the people he paints. Stephen Pace’s work evolved from realism through pure abstraction to his personal style that involves figurative abstraction and a deliberate use of brushwork that has become his signature. Through the study of Pace’s work and inspirations, and an exploration of the student’s local environment, students will discuss related concepts and produce original, creative solutions to specific criteria. 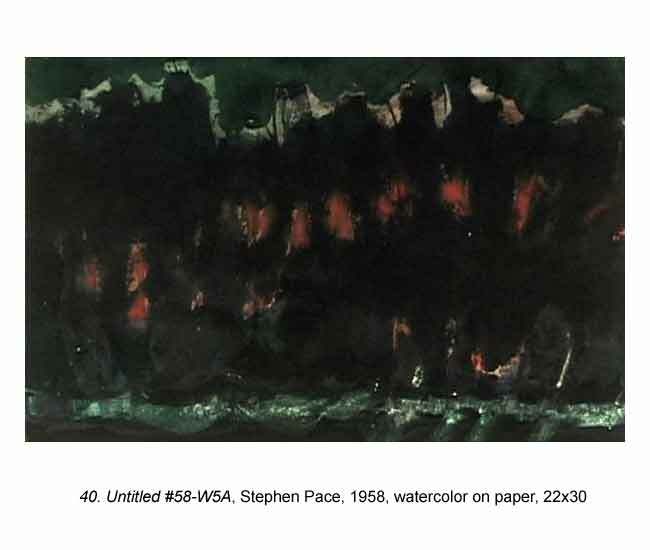 Supplemental Research - Influences on Stephen Pace’s Artistic Development: Gertrude Stein, Milton Avery, Franz Kline, Willem DeKooning, Hans Hoffman, Henri Matisse, Pablo Picasso. Time: 45 - 80 min. Students can be given a few minutes before the DVD to review the viewing questions and answer them while watching the DVD. The post-viewing questions are more in-depth. Answers can be written and discussed in class or assigned as homework for later discussion. Students can be assessed on the understanding of the objectives for viewing the film through their participation in the discussion of the DVD and the quality of their answers to the viewing and post-viewing questions. Please read the following questions and jot down ideas for your answers as you watch the DVD. Be prepared to discuss your answers after the viewing. Download and print a PDF of these questions. 1. What was Pace’s early family life like? Where did they live? What kind of work did they do? 2. 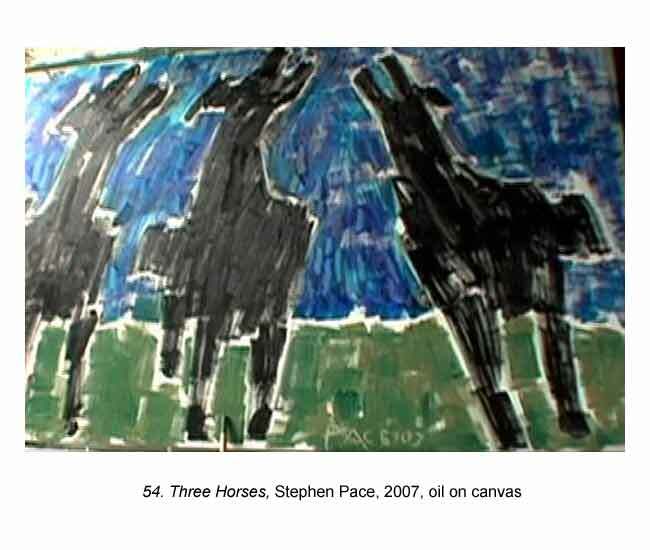 What did the horses in Pace’s painting symbolize? 3. What was Pam Pace’s role in Pace’s life as an artist? 4. What is unique about Pace’s painting style? 5. Why did Pace go to Mexico? 6. List three important things that happened to Pace when he went to New York. 7. 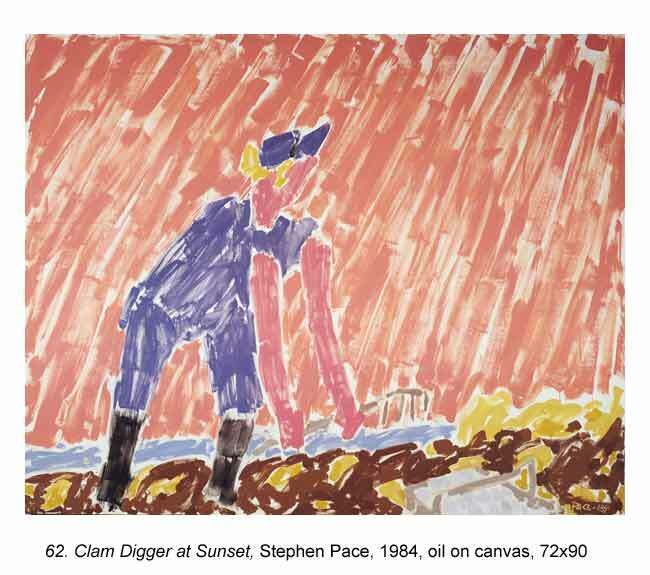 What important artist became Pace’s friend in New York? 8. 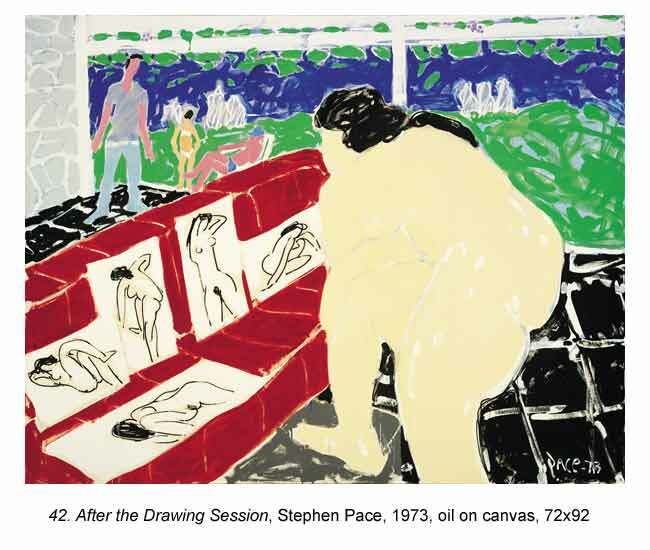 Why was Han Hofmann’s class in New York important in Pace’s artistic development? 9. What were the themes of Pace’s painting in Maine? 1. Why did Pace return to figurative painting after his abstract painting period in New York ? 2. What is the “sense of place” in Pace’s work and how does it influence his subject matter? 3. What does Pace mean by “I don’t paint what I see, I paint what I saw”? How does it affect his work? 4. Pace had a close community of artists in New York. How did that community affect his work there? 5. In what ways can any community of artists influence each other? Through a study of the local rural and/or urban environment, students will document and create imagery and compositions that reflect their personal knowledge of specific places. They will engage in a creative process that will lead to an original, abstract painting that addresses the subject with a selected painting medium using bold, symbolic brushstrokes to develop visual texture and forms. • Explore and examine the regional environment and geography: public records, field trips, web sites, and library resources. • Take photographs and/or make sketches on site (5-10 sketches/photos). • Identify and draw a contour line with a black fine-tip marker, or a bamboo brush and ink around the major positive and negative shapes in each of the sketches. Select three drawings that have harmonious compositions. Look for repeated or related shapes and lines, rhythm and balance. Explain your decisions to the class or smaller group. • Abbreviate the texture with symbolic brushwork: (2-1/2 hours) • Refer to the photographs and examine the major textures in the selected landscapes. Identify the patterns or repeated lines and shapes that create those textures. • Create several, small contour line drawings of those shapes. “Recreate” those symbols with one stroke/mark. Use different size and shape paint brushes, and black paint (or ink) on a separate piece(s) of paper. Select the mark that best represents that symbol and repeat it, creating a “pattern”. The repeated symbolic marks will represent the essence of the original texture. • Repeat the pattern of brushstrokes in the corresponding major shape(s) in your selected contour drawings. Create and assign symbolic marks/brushstrokes (textures) for all major landscape textures in each selected line drawing. • Select one of the three drawings. This landscape will be enlarged and “recreated” in color. Explain your decisions to the class or smaller group. • Select a limited pallet, 2-4 colors, from specific color harmonies: Complementary, Analogous, Triad, Tetrad or Split-complement. Black and white may be used and mixed with pure hues to achieve tints and shades. • Practice the symbolic brushstrokes that represent the various textures with specific color(s) on a separate piece of paper. The larger format may require larger brushes for making marks. • Create the landscape painting on an 18”x24” format. The kind of paint may dictate the surface material (heavy white paper, primed canvas, gessoed paper). Tape paper to a flat surface allowing a 1/4”-1/2” border. The paint will be applied directly. No preliminary drawing on the canvas/paper (separate sketches only). The paint should be fluid. If it wants to drip, let it! Carefully remove the tape from the dry, completed painting. • Compare the final 18”x24” painting and three 9”x12” paintings to the original line drawing and photograph. • A student many want to create more than one larger painting of other compositions. • The journal/notebook may be a document of the process that includes the initial photo or sketch, the contour drawings, all preliminary paintings, interviews, research, written documentation, and other writing activities. • Write a two-paragraph description of the landscape that prompted the painting. • Write a list of 10-15 adjectives, verbs and nouns that describe that landscape. Select six words from the list and write a five-line poem incorporating those six words. Resources link for listing of museums and galleries. Through a study of a variety of careers and work environments, students will document and create imagery and compositions that reflect their personal observations of people engaged in work. The compositions will emphasize the relationship of the figure with his/her environment. Students will engage in a creative process that will lead to an original, abstract painting that addresses the subject with a selected painting medium using bold brushstrokes to develop forms. • Select images or sections of the images – compositions that use the space effectively. Look for repeated or similar shapes, lines and colors. Consider the relationship of the figure (organic) in the structured (geometric) environment, and the shapes and lines with the edges of the 9x12 space. • Identify the positive and negative shapes in each of the sketches and draw a contour line around each shape with a black fine-tip marker. Explain your decisions to the class or smaller group. • Refer to the three selected photographs/sketches and examine the colors. Are they repeated or similar? Do you see complimentary colors? • Identify and mix the major colors. Select a limited pallet (2-4) colors from specific color harmonies: Complementary, Analogous, Triad, Tetrad or Split-complement. Black and white may be used and mixed with pure hues to achieve tints and shades. • Use different size and shape paintbrushes, and apply the color to the corresponding shapes with one coat of fluid paint. Apply the paint with short, repeated, visible brushstrokes. Use a different technique with each painting, such as filling each shape with color or leaving spaces between the brushstrokes. Recognize the patterns produced with repeated mark-making. The brushwork technique should be consistent in each painting. • Select one of the three compositions and the brushwork technique you prefer. (The preferred composition and brushwork may not be the same painting.) Explain your decision to the class or smaller group. Create two 9”x12” paintings of the selected composition in the preferred style. Vary the size of your brushes. Repeating this technique will make it your own and familiarize you with the forms in the composition. This composition will be enlarged. • Create the painting on an 18”x24” format. (The kind of paint may dictate the surface material - heavy white paper, primed canvas, gessoed paper. Tape paper to a flat surface allowing a 1/4”-1/2” border.) The paint will be applied directly. No preliminary drawing on the canvas/paper. Consider the size and shape of your brushes for the larger format. The paint should be fluid. If it wants to drip, let it! Carefully remove the tape from the dry, completed painting. • Document an interview the individual(s) depicted in the painting about their occupation and lifestyle. • Write a two-page essay about the occupation that prompted the painting. • Write a list of 10-15 adjectives, verbs and nouns that describe that work or the worker. Select six words from the list and write a five-line poem incorporating those six words. Through a study of their family, students will document and create imagery and compositions that reflect their personal observations of family members engaged in work, play or “ordinary moments”. 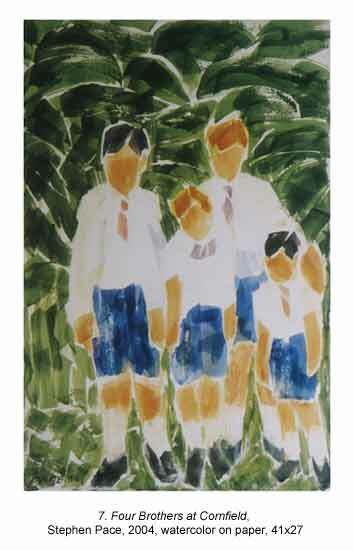 The compositions will emphasize the inter-relationship of the figure(s) with each other and their environment. Students will engage in a creative process that will lead to an original, abstract painting that addresses the subject with a selected painting medium using bold brushstrokes to develop forms. • Interview family members about their work, life-style, each other, and history (past and present). Encourage family stories. • Visit work/play sites of family members. • Collect family photographs (past & current). • Take photographs or make sketches of family members in their environment: home, work, play, and “ordinary moments” engaged in their work. • Select images or sections of the images – compositions that use the space effectively – and communicate the relationship between the family members. Look for repeated or similar shapes, lines and colors. Consider the relationship of the figure(s) with each other, the shapes that create their environment, and the relationship of the shapes and lines with the edges of the 9x12 space. • Identify the positive and negative shapes in each of the sketches and draw a contour linearound each shape with a black fine-tip marker. Explain your decisions to the class or smaller group. • Refer to the three selected photographs/sketches and examine the colors. Are they repeated or similar? Do you see complementary colors? Select colors that will communicate the relationship between the family members and other elements in the environment. • Identify and mix the major colors. Select a limited pallet 2-4 colors from specific color harmonies: Complementary, Analogous, Triad, Tetrad or Split-complement. Black and white may be used and mixed with pure hues to achieve tints and shades. • Transfer each of the three line compositions to clean sheets of paper. Use light pencil lines that can be easily covered with paint or erased. • Use different size and shape paint brushes, and apply the color to the corresponding shapes with one coat of fluid paint. Apply the paint with short, repeated, visible brushstrokes. Use a different technique with each painting, such as filling each shape with color or leaving spaces between the brushstrokes. Recognize the patterns produced with repeated mark making. The brushwork technique should be consistent in each painting. Variety may be achieved with different size and style brushstrokes. • Create the painting on an 18”x24” format. The kind of paint may dictate the surface material (heavy white paper, primed canvas, gessoed paper). Tape paper to a flat surface allowing a 1/4"-1/2” border.) The paint will be applied directly. No preliminary drawing on the canvas/paper (separate sketches only). Consider the size and shape of your brushes for the larger format. The paint should be fluid. If it wants to drip, let it! Carefully remove the tape from the dry, completed painting. • Document family stories, and create a short story based on one of those stories. • Write a list of 10-15 adjectives, verbs and nouns that describe that family member of event. Select six words from the list and write a five-line poem incorporating those six words. • Field trip to local museum or gallery to see Pace’s original works. See Sources/Resources link for listing of museums and galleries. Click on a painting in the list below to view or project it individually. 4. 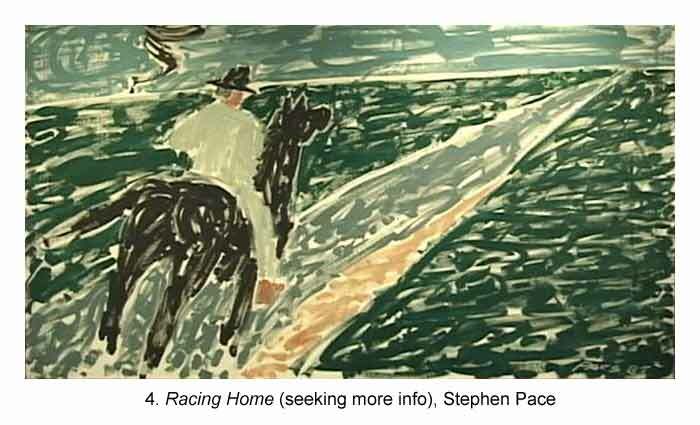 Racing Home, Stephen Pace. 15. Mother, early drawing, Stephen Pace. 16. Myrna Loy, early drawing, Stephen Pace. 17. Magazine Copy, early drawing, Stephen Pace. 18. 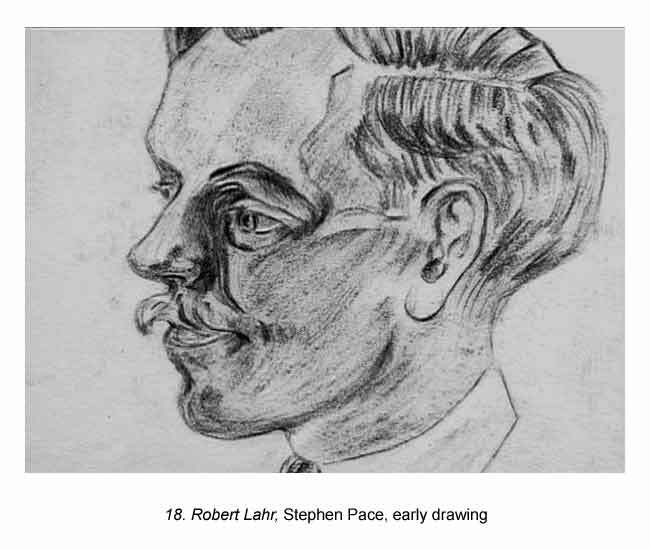 Robert Lahr, early drawing, Stephen Pace. 19. 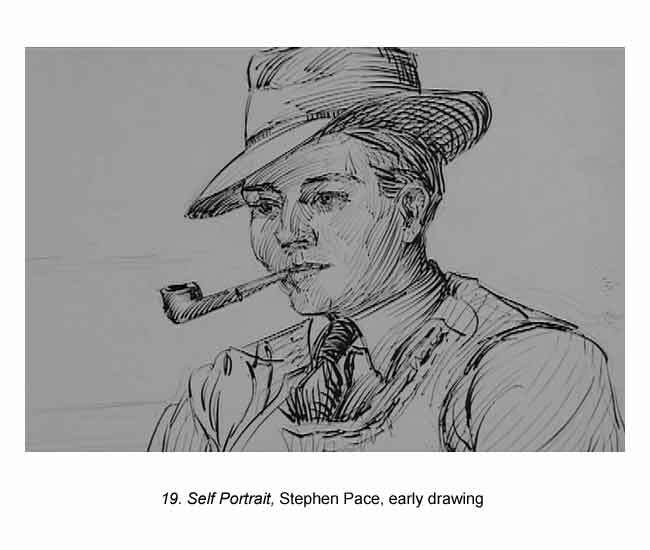 Self Portrait, early drawing, Stephen Pace. This guide is clear and well organized. This guide is easy to use. This guide is easily accessible for my use. The lesson plans are clear and well organized. The lesson plans are age appropriate. The time guidelines in the lesson plans are adequate. I will use one or more of these lesson plans again. Which of the lesson plans did you choose to use and why? How can this guide be improved to meet you or your students needs? Please share any other curricular ideas you might have or other ways you might use this film and guide. We respect your privacy. If you choose not to share your name and e-mail address, we will not share it with others.